To unite the efforts of the parents, teachers and other parishioners of St. Mary's in providing each child with a quality Catholic education. To provide a communication link between the home and school. To provide an opportunity for parents to become more involved in their children's education. To welcome new students and families to St. Mary's School. To provide resources and monetary support to St. Mary's School. To support the staff members at St. Mary's School. 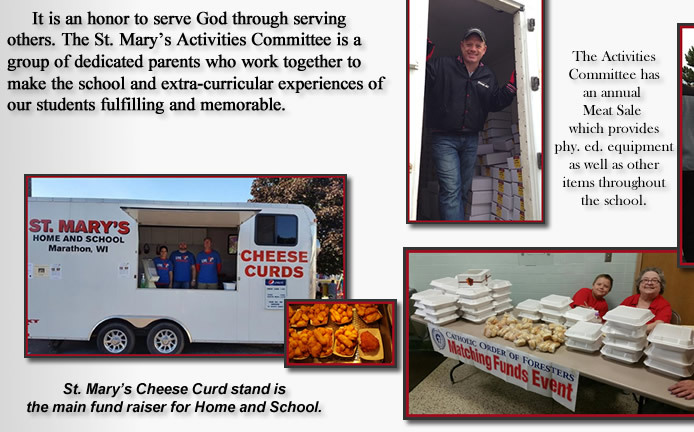 The Committee raises money to support our students' educational and social opportunities through technology, accelerated reader programs, science programs, high school and post-secondary scholarships, student activities and field trips.